While the colours of the rising sun were beginning to play over the skies of a still Pacific morning on the first day of March 1954, a second sun suddenly and furiously erupted from Namu Island in the Bikini atoll. It was the fiery fruition of the determination of Hungarian physicist Edward Teller to gift the world with a weapon as powerful as the sun itself, a weapon based on the fusion of hydrogen atoms. Within one second of that infernal detonation, an immense fireball 7 kilometres in diameter had formed. In less than a minute, the fireball had risen to a height of 14 kilometres. Eight minutes later, the fiery cloud had billowed out to a height of 40 kilometres and had spread out over a distance of 100 kilometres. Even so, it continued expanding outwards at a rate of more than six kilometres a minute. Beneath this unearthly fury, the Bikini atoll had been riven in two by a gaping crater two kilometres wide and 60 metres deep. The clever men who had worked so hard to create such a weapon were well pleased. The 80,000 inhabitants of the Marshall Islands, in which the Bikini atoll was situated, were to suffer for generations to come. And the world was thereafter blighted by a new destructive energy that was to be claimed by powerful military establishments around the world. Rongelap atoll lies 170 kilometres to the east of Bikini. On the morning of March 1st 1954, the sky lit up as it had never lit up before. The atoll shuddered as from an earthquake and a horrific roar filled the air. Soon after, white flakes began to fall from the sky covering everything on the atoll with a layer of ash up to two centimetres thick. The sky had turned a ghastly grey and families gathered together wondering what had happened. The children played with the strange “snow” fallen from the heavens. Some even tasted it to see what it might be. A day later, some Americans arrived by boat. They were wearing full protective clothing and proceeded to take measurements with their Geiger counters. According to the islanders, they came and went within 20 minutes and did not speak to anyone during that time. Several US navy boats returned the following day - more than 48 hours after the initial blast - and began to evacuate the islanders. Even before the Americans arrived, many of the inhabitants of Rongelap were becoming sick. Many were vomiting and had developed diarrhoea. Within a few days, their skin started itching and burning and began to develop black-pigmented areas that soon became ulcerated and infected. Within a fortnight, most had lost their hair and blood tests showed significant pathological changes in cell counts. This was but the beginning of a tribulation that continues to sear the lives of three generations of Marshall Islanders. 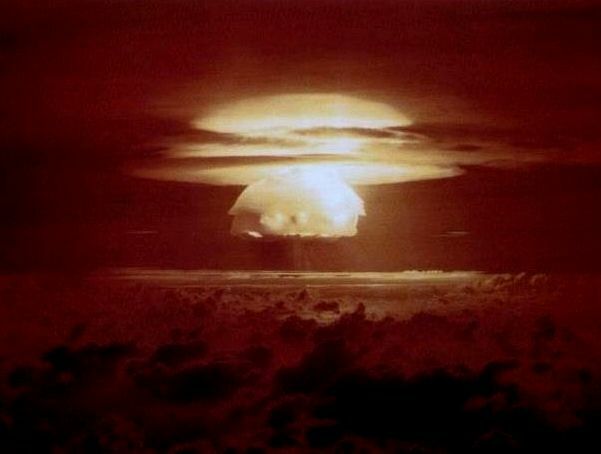 Further afield, the radioactive plume from the Castle Bravo atomic test had settled on numerous inhabited atolls throughout the Marshall Islands archipelago, exposing many thousands of their inhabitants to varying levels of radioactivity. Within a year of the atomic slayings of Hiroshima and Nagasaki, the US military had claimed the Marshall Islands as a new testing ground for nuclear weapons. As a result of backroom negotiations, the United Nations handed over the Marshall Islands to the US as a Protectorate in July 1947. Yet in June 1946, a full year before the UN handover, the US Navy had already exploded a 23-kiloton atomic bomb above Bikini atoll. Three weeks later, they detonated a similar device 90 feet below the atoll. As the Promethean games began in earnest, the term “protector” came to acquire a perverse new meaning. At the end of World War II, Stalin set about ensuring that the Soviets would not be left behind in the race for nuclear supremacy. Armies of engineers and scientists were put to work. Within four years, the Soviets had constructed a replica of the Fat Man bomb used over Nagasaki. It was tested in August 1949 and proved to have an explosive power of 22 kilotons, the equivalent of 22,000 tons of TNT. This successful detonation by the Soviets drove US military planners into a frenzy of renewed activity. They soon enlisted the support of Edward Teller who, even while working on the Manhattan Project five years earlier, had spoken of the feasibility of producing a fusion bomb based on deuterium and tritium, the isotopes of hydrogen. He claimed that theoretically, there was no limit to the explosive power of such a weapon. After the Soviet atomic test in 1949, Teller set to work convincing his colleagues that the time had come to develop a more powerful weapon based on thermonuclear fusion. Both J. Robert Oppenheimer, who directed the Manhattan Project, and his colleague Enrico Fermi had earlier voiced their opposition to the construction of such a bomb. But the successful Soviet atomic test changed everything. After intense lobbying at the highest levels by Teller and his military supporters, US president Harry Truman rubber-stamped the project in 1950. Many of the nuclear physicists who had worked on the Manhattan Project were brought together once again. Within a short time, a group of 20 scientists calling themselves “The Matterhorn Gang” were furiously developing theoretical formulae to compute the progress of a man-made thermonuclear combustion process. The calculations proved so formidable that IBM programmers in New York, the entire computation department of the University of Pennsylvania, and the operators of the large experimental computers owned by the US government at the time were called into the project. Most of the available computing power in the United States was handed over to the scientists at Los Alamos. Simultaneously, architects and engineers began work on the design and construction of a large-scale heavy water nuclear reactor at Savannah River in South Carolina. Once completed, this facility was to produce the large amounts of tritium that enabled the production of a massive arsenal of thermonuclear weapons by the US for the following forty years. liquefy the deuterium used to fuel the bomb. The whole assembly weighed over 60 tons. This structure was linked to a two-mile long tunnel filled with helium, which enabled scientists to determine what occurred in those infinitesimally small moments during which the fusion reaction commenced. Despite the fact that Teller had driven the process from the start, he did not join the audience of over 10,000 mainly military observers gathered around Bikini Atoll to witness the event. He chose instead to monitor the explosion on a seismograph in a Californian laboratory. Teller reasoned that if the detonation was successful, its shock waves would be felt on the US West Coast, 8,000 km away. He had reasoned correctly. Long before word of the event could arrive through the usual channels, Teller jubilantly reported the success of the operation to his colleagues at Los Alamos, and to his political and military sponsors in Washington. Ivy Mike exploded with a force of 10.4 megatons, the equivalent of 10.4 million tons of TNT. It completely vaporised the structure in which the bomb was housed leaving a crater more than one and a half kilometres wide and produced an immense mushroom cloud 160 kilometres wide and 40 kilometres in height. The blast destroyed all life on the immediately surrounding islands. Inspired by their success, Teller and his group immediately set to work on building a new bomb that would be “deliverable” by air to any nominated target. In the design changes that followed, the liquid deuterium used in the first thermonuclear explosion was replaced by solid lithium deuteride. This could be detonated in such a way as to split the lithium atoms into heavy isotopes of hydrogen, thereby providing the necessary fuel for a thermonuclear fusion process. This new design formed the basis of the Castle Bravo bomb that was detonated at Bikini atoll on March 1st 1954. Despite their most careful calculations, Teller and his group seriously underestimated the explosive power of their second more portable bomb. They had predicted a yield of five megatons, but when their baby burst forth into the world, it flashed out at an astonishing 15 megatons – a thousand times more powerful than the bomb dropped on Hiroshima - and spewed millions of tons of radioactive debris throughout the region. Stalin and his scientists had in the meantime been watching these developments with great interest. On August 12th 1953, nine months after the Ivy Mike test, the Soviets exploded their own thermonuclear device. It came in at 400 kilotons, nearly 30 times more powerful than the bomb used in Hiroshima. Unlike the first US hydrogen bomb however, the Soviets had produced a useable weapon that could easily be dropped from a plane. Two years later, the Soviets detonated a more respectable 1.6-megaton hydrogen bomb at Semipalatinsk in northeast Kazakhstan. The party got progressively wilder. Within six years, the Soviets exploded Tsar Bomba, a mother of a bomb that clocked in at 58 megatons. In real terms, that single bomb carried the explosive power of 58 million tons of TNT, or the equivalent destructive power of 4,000 Hiroshima-size bombs. At the time, Soviet president Nikita Khrushchev boasted that his scientists and engineers could easily have built a larger bomb, but were restrained by the fact that the Soviet Union was not large enough to absorb a shock that would shatter windows 6,500 kilometres away. Edward Teller had been correct in his prognostications. There was in fact no limit to the explosive power that could be released in thermonuclear detonations. “Up to now (August 1962) there have been 106 nuclear tests since testing began again (almost a year). Thirty-one of these by the USSR, seventy-four by the USA, and one by Britain, in the USA (Nevada). The USA has made twenty-nine atmospheric tests, twenty-six in the South Pacific and three in Nevada. The USA has also made forty-four underground tests and one in the stratosphere. Total of all nuclear tests since the beginning: USA 229, USSR 86, UK 22, France 5. Grand total: 342 tests, of which 282 were in the atmosphere. Unfortunately, it was not such nice going for the people of the world, and more particularly, for the people of the Marshall Islands who had in the 12 years between 1946 and 1958, weathered the fallout of 67 atmospheric tests conducted by the US military. Within ten years of the Castle Bravo test, 90% of the children who were under 12 years old on Rongelap at the time of the explosion had developed thyroid tumours. Marshall Islanders continue to have one of the world’s highest rates of abnormalities of the thyroid. There is a more sinister dimension to the experience of the Marshall Islanders that has only recently come to light. Even before the Castle Bravo detonation, a research document entitled Project 4.1 carried the statement that the Bikini blast would enable a “study of responses of human beings exposed to significant beta and gamma radiation due to fallout from high yield weapons.” That particular document was circulated on November 10, 1953, four months before the test. What had been observed after the bombing of Hiroshima and Nagasaki was simply not enough. More data was needed and the Marshall Islands, being at a suitable remove from the US mainland, provided an opportunity for some “useful” information to be gathered. Those who oversaw the “management” of the Marshallese affected by the atomic tests knew exactly what they were doing. The irradiated inhabitants of Rongelap were removed from the island three days after the Castle Bravo test. They have been monitored on and off ever since. In 1957, they were returned to their island by US authorities. During their three-year absence, the US continued to carry out both atomic and thermonuclear weapon tests in the region. A further 11 thermonuclear tests had been conducted on Bikini atoll, while an additional eight atomic and three thermonuclear tests were carried out on Eniwetok atoll. No attempt was ever made to clear Rongelap of the huge amounts of fallout to which it had been exposed. The Rongelapese were told that it was perfectly safe for them to return to their ancestral lands. They were, however, advised to avoid the more northern islands in their fishing expeditions. It was also suggested to them that they should eat mainly imported canned food. During the 1970s, the inhabitants of Rongelap had become increasingly distrustful of reassurances by US government representatives about the safety of their land. Mothers were concerned about the number of children who had been born with birth defects and those who had been diagnosed with leukaemia and thyroid tumours. They began to ask questions and to seek independent advice. In 1983, the people of Rongelap were finally given copies of a translation of a US Department of Energy document prepared five years beforehand in 1978. The document stated conclusively that many parts of the island they had lived on since 1957 had a contamination rating of Level 3, the same as that deemed for both Bikini and Eniwetok atolls where all human habitation was forbidden. Their worst fears were realised. They immediately contacted the US authorities and asked to be evacuated from the island. Their requests were politely ignored and they were again reassured by the US Department of Energy that Rongelap was “safe” and that there was no cause for concern. Yet they remained desperately concerned about their own and their children’s futures. Again, they sought outside help. 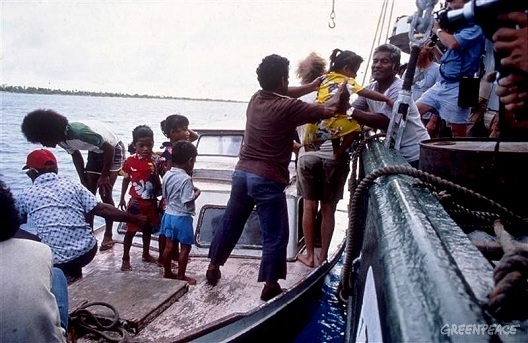 The Greenpeace yacht Rainbow Warrior travelled to Rongelap in May 1985 in order to relocate all of the inhabitants to Mejato Island, 180 kilometres away. This was to be the last action of the Rainbow Warrior. Two months later, the Greenpeace yacht was on the bottom of Auckland Harbour after having been torn apart by two bombs planted by agents of the French government, which had been creating its own share of nuclear havoc in the Pacific. By 1988, the US government was forced to acknowledge the extent of the contamination of Rongelap, declaring parts of the island group “forbidden territory” and, in the words of Beverley Keever, “recommending that the remaining part would be safe only if inhabitants ate imported food for the next 30 to 50 years” (italics in original). During the 28 years from 1957 and 1985, the inhabitants of Rongelap had been continuously and knowingly exposed to dangerous levels of Caesium 137, Strontium 90 and a white-hot cauldron of long-lived radioactive isotopes that had settled everywhere. Clean-up operations on Rongelap began in 1999, with massive amounts of potassium being shipped to the island. This was added to the soil in order to decrease the uptake of radioactive caesium by plant life. Despite the horrendous damage that has been done to their lands, the people of Rongelap have over the past year begun to return to the islands that they had inhabited for over 4,000 years with new assurances from the US government that future generations of their children will be safe from the effects of the decades-long nuclear testing program in the Marshall Islands. The story of Rongelap is not an isolated event in the sordid history of nuclear adventurism. Between 1945 and 1998, the US has conducted a total of 1,054 nuclear tests, over 330 of which were atmospheric. The Soviets have detonated over 700 nuclear weapons during the same period. Between 1966 and 1996, the French have carried out nearly 200 nuclear detonations - both atmospheric and underground - in Moruroa and Fangataufa atolls in Polynesia. China has conducted 45 tests, as has the UK, while India, Pakistan and North Korea have between them exploded 14 nuclear devices. What we have witnessed during this time is the dehumanisation of certain aspects of the scientific project. This is not a peculiar feature of twentieth century civilisation, but was clearly evident in the calls of Francis Bacon nearly five centuries ago to extract “nature’s secrets” by whatever means possible. This attitude toward the natural world was further spurred by Rene Descartes in his declaration that life is essentially a clockwork mechanism that can be subjected to the demands and manipulations of the res cogitans, the sphere of human thought and will. The free expression of the seemingly limitless power of human rationality has come at the cost of distancing the human heart and human feeling from the determinations of so-called dispassionate science and research. Yet the present over-reach has brought in its train its own inherent breakdown. Having failed to cultivate the capacity to reflect on the human and natural consequences of our projection of power in the material world, we have lost sight of the sustaining forces that have enabled such projections to begin with. We are both in the world and of the world. And as the air, earth, fire and water within which we live, move and have our being become progressively more damaged and more toxic, so too ourselves. Within the sweep of history, the fate of the people of Rongelap is but another small stain in the wash of blood and grief that reaches far beyond the vast charnel grounds of time and empire. The gift of human intelligence has yet to be sufficiently informed by the greater gift of human wisdom. The power of the human will has yet to be sufficiently infused by the greater power of human love. For the more masochistically inclined, there is fascinating insight to be gained regarding the mindset of the scientists involved in the creation of both the atomic and thermonuclear weapons at Los Alamos in a series of video remembrances by Edward Teller recorded in June 1996.